BeeVeryCreative, the first Portuguese 3D printer manufacturer, has launched a worldwide 3D modeling challenge known as “3D Print World Challenge – 3D modelling awesomeness for everyone, everywhere.” The contest is open to anyone, anywhere, and allows as many entries as you wish. There will be six winners, each receiving an awesome prize – three of which happen to be the “BeeTheFirst 3D Printers” complete with eight spools of filament. 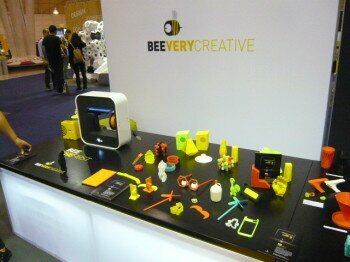 BeeTheFirst 3D printers retail at around $2200. 3D printing has become more and more popular, and to promote awareness the 3D print industry is looking for ways to bring 3D printing to the general public. Much of this awareness has been in the way of creative challenges, and the BeeVeryCreative Challenge is no exception. The contest will run for two months, starting April 17 and ending on June 17. It is being sponsored by 3DPrintShow, Modalisboa, and 3DArtistOnline. The entrants who submit their entries must create a 3D printable model in a STL format. The model must fit into one of the following categories: Architecture, Design, or Utilities. The 3D printed models will first be printed using a BeeTheFirst 3D printer, and if it successfully passes the print test, the model will be entered into the challenge. Entries will then be judged by representatives from BeeVeryCreative, 3D Print Show, 3D Artist, and Modalisboa, and will be judged on creativity, feasibility for printing on the BeeTheFirst printer, and of course – awesomeness.